As one of the Prudential Funds fund, it has total net assets of $4.59 million. This natural resources mutual fund was first introduced to public in January 1990. Neil P. Brown has started managing this fund in July 2006. He is the Principal of Jennison. The other members of the portfolio management team are Jay Saunders, David Kiefer, Jennison Associates as Subadviser and Abhi Kamerkar as Fund Portfolio Adviser. The annual expense ratio is 1.16%. It also has annual holdings turnover of 34.00% as of December 29, 2011. There is a 0.30% management fee, and 5.50% front-end sales load fee. The best 1-year total return within 15 years of positive returns year was occurred in 2009 with 73.17%. The worst 1-year return was occurred in 2008 with -52.87%. Based on the load adjusted returns, this domestic stock fund has returned 14.93% over the past 10-year and 1.75% over the past 3-year. It also has YTD return of -3.45%. Morningstar analysts rated this domestic stock fund with 2-stars rating and Silver rating. 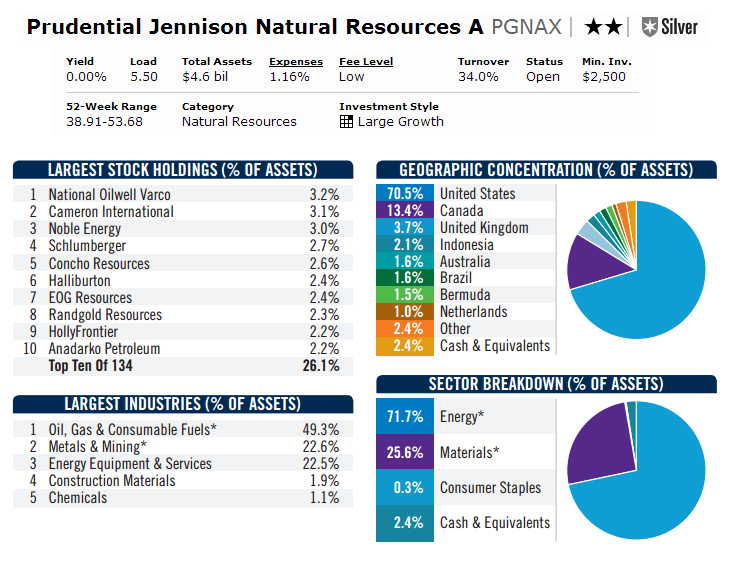 Lipper Global Natural Resources Index is the benchmark of this fund. Investors can buy this mutual fund with $2,500 initial funding for brokerage account and $1,000 for retirement account. The minimum subsequent investment needed is $100. This equity fund is available for purchase through a wide selection of 124 brokerages. They are Schwab Retail, Merrill Lynch, JP Morgan, Td Ameritrade Inc, Fidelity Retail Funds Network, Scottrade Load, Morgan Stanley Advisors, etc. The other classes of this fund are Class B (PRGNX), Class C (PNRCX), Class Q (PJNQX), Class R (JNRRX) and Class Z (PNRZX). 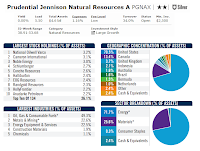 The top 10 stock holdings of 134 holdings are National Oilwell Varco (3.2%), Cameron International (3.1%), Noble Energy (3.0%), Schlumberger (2.7%), Concho Resources (2.6%), Halliburton (2.4%), EOG Resources (2.4%), Randgold Resources (2.3%), HollyFrontier (2.2%) and Anadarko Petroleum (2.2%). The top largest industries per percentage of assets are Oil, Gas & Consumable Fuels (49.3%), Metals & Mining (22.6%) and Energy Equipment & Services (22.5%). According to the fund prospectus, the principal risks of investing in this fund are market risk, natural resources companies risk, non-diversification risk, management risk, equity and equity-Related securities risk, foreign securities risk, etc.